Does your Degus do tricks like dance for its food? That is very interesting to see them in action with the rake. I know several animals use tools such as the chimps and bombas( i think that spelling is right). Unfortunately, neither of our degus dance. However, they have become more interested in allowing us to hold them if we give them a sunflower seed-their favorite treat. 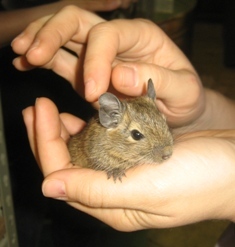 Also, to clarify, the degu in the video is not one of ours; it was a research degu from Japan. Tool use by animals is a very interesting behavior studied by many researchers among many types of species. Chimpanzees and bonobos are highly studied, probably for their behavioral similarities to humans. Most animals use tools for one purpose: Obtaining food! Not only are primates, birds, fish, & other vertebrates capable of using tools, but invertebrates are capable of tool use. The octopus has been found to use rocks as tools to close the opening to their den. Thank you for the questions! Next Post Draw Dinos Right!